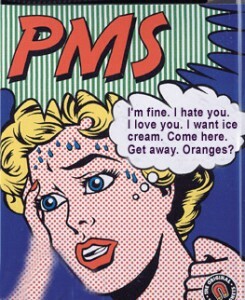 Some women experience symptoms of PMS during adolescence. They complain of bloating, weight gain, mood swings, anxiety, irritability, tender breasts and may have heavy bleeding and cramps. This can be due to too much estrogen in relationship to progesterone. It takes a while for the ovaries to ramp up and ovulation to occur. Progesterone is produced when ovulation occurs. Ovulation and hormonal cycles tend to become smoother in the late teens and twenties and symptoms may be less or absent. Many women feel better during pregnancy because their hormones are not fluctuating. Some may crash after childbirth and suffer post partum depression. Perimenopausal symptoms are similar and the reason for these symptoms may be the same. It is usually caused by insufficient progesterone because ovulation is sporadic. Women start to run out of eggs in their 30’s. The peri menopausal period can start as early as the mid thirties or 40’s and go on for 10 or more years. Those who experience symptoms all say that they don’t feel like themselves and feel irritable, out of control and fly off the handle. Some have heavy bleeding and fibroids and periods may become irregular. The antidote to the symptoms caused by estrogen dominance is natural hormone replacement therapy with bioidentical progesterone. Progesterone is a diuretic that is calming. It relieves anxiety, bloating and regulates women’s cycles. It can relieve breast tenderness, level mood swings and shrink breast cyst . It may also prevent formation of fibroids. Bioidentical progesterone as opposed to synthetic progestin has has positive benefits on the heart, brain, uterus and breast. Synthetic progestins such as medroxyprogesterone may be the culprit that increases the risk of breast cancer. Many women are confused by conflicting information in the media and literature. I study the studies so you don’t have to. There is no need to suffer from hormone imbalances. For more information schedule a consultation or coaching session. I want to help you perform at your peak and look and feel your best.